One way to cope with the information flood in GC logs is to write custom parsers for GC log files to visualize the information. In most cases it would not be a reasonable decision due to the complexity of different GC algorithms that are producing the information. Instead, a good way would be to start with a solution that already exists: GCViewer. GCViewer is an open source tool for parsing and analyzing GC log files. The GitHub web page provides a full description of all the presented metrics. In the following we will review the most common way to use this tool. The first step is to get useful garbage collection log files. They should reflect the usage scenario of your application that you are interested in during this performance optimization session. If your operational department complains that every Friday afternoon, the application slows down, and if you want to verify whether GC is the culprit, there is no point in analyzing GC logs from Monday morning. The chart area is devoted to the visual representation of GC events. The information available includes the sizes of all memory pools and GC events. In the picture above, only two metrics are visualized: the total used heap is visualized with blue lines and individual GC pause durations with black bars underneath. The first interesting thing that we can see from this picture is the fast growth of memory usage. In just around a minute the total heap consumption reaches almost the maximum heap available. This indicates a problem – almost all the heap is consumed and new allocations cannot proceed, triggering frequent full GC cycles. The application is either leaking memory or set to run with under-provisioned heap size. The next problem visible in the charts is the frequency and duration of GC pauses. We can see that after the initial 30 seconds GC is almost constantly running, with the longest pauses exceeding 1.4 seconds. On the right there is small panel with three tabs. Under the “Summary” tab the most interesting numbers are “Throughput” and “Number of GC pauses”, along with the “Number of full GC pauses”. Throughput shows the portion of the application run time that was devoted to running your application, as opposed to spending time in garbage collection. In our example we are facing throughput of 6.28%. 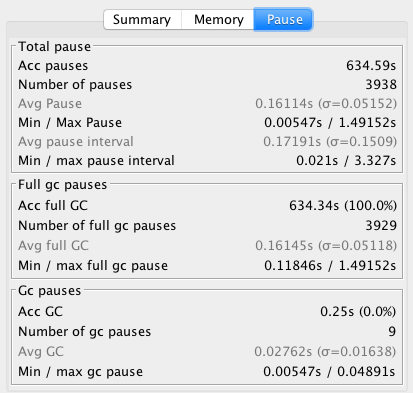 This means that 93.72% of the CPU time was spent on GC. It is a clear symptom of the application suffering – instead of spending precious CPU cycles on actual work, it spends most of the time trying to get rid of the garbage. The “Pause” tab exposes the totals, averages, minimum and maximum values of GC pauses, both as a grand total and minor/major pauses separately. Optimizing the application for low latency, this gives the first glimpse of whether or not you are facing pauses that are too long. Again, we can get confirmation that both the accumulated pause duration of 634.59 seconds and the total number of GC pauses of 3,938 is much too high, considering the total runtime of just over 11 minutes. Here you can see a summary of all the important GC events recorded in the logs: minor and major pauses and concurrent, not stop-the-world GC events. In our case, we can see an obvious “winner”, a situation in which full GC events are contributing the most to both throughput and latency, by again confirming the fact that the 3,928 full GC pauses took 634 seconds to complete. Low throughput. When the throughput of the application decreases and falls under a tolerable level, the total time that the application spends doing useful work gets reduced. What is “tolerable” depends on your application and its usage scenario. One rule of thumb says that any value below 90% should draw your attention and may require GC optimization. Excessively long individual GC pauses. Whenever an individual pause starts taking too long, the latency of the application starts to suffer. When the latency requirements require the transactions in the application to complete under 1,000 ms, for example, you cannot tolerate any GC pauses taking more than 1,000 ms.
High heap consumption. Whenever the old generation remains close to being fully utilized even after several full GC cycles, you face a situation where the application is at its limits, either due to under-provisioning resources or due to a memory leak. This symptom always has a significant impact on throughput as well. 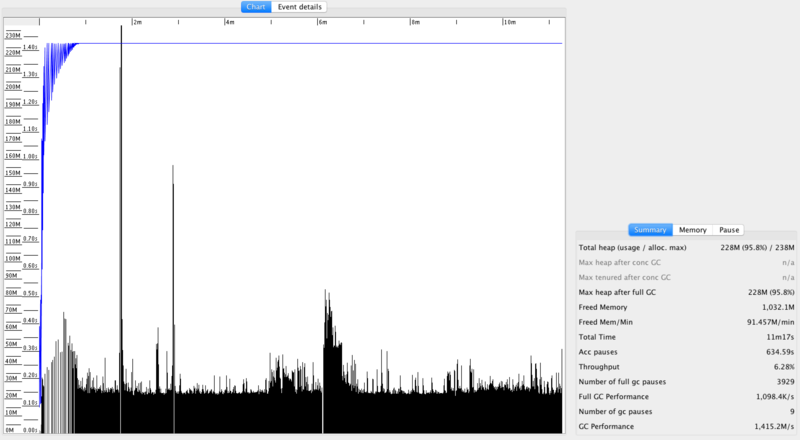 As a general comment – visualizing GC logs is definitely something we recommend. Instead of directly working with lengthy and complex GC logs, you get access to humanly understandable visualization of the very same information.